Docks are a great way to enjoy water front properties, putting you a few feet away from the lake or pond. As much fun and enjoyment docks offer, they can also be a lot of work. To avoid damaged docks over the winter you need to winterize them and they can require maintenance and repair. 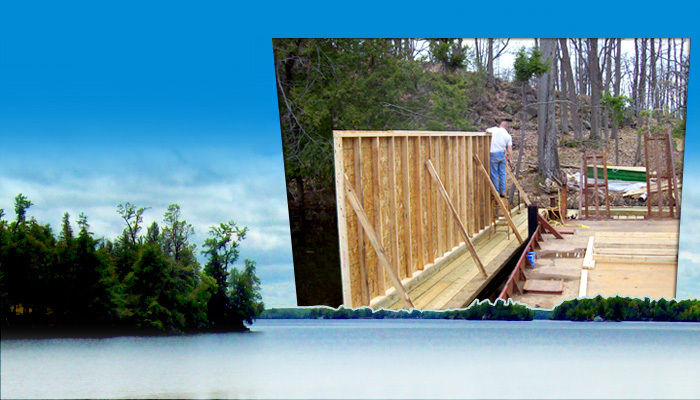 These dock builders and repairmen in Perth Ontario specialize in dock servicing, construction and repair for floating or shoreline docks. Contact one of these dock specialist serving Perth Ontario today to find out how they can keep your dock looking and functioning like new. dock and deck needs. We service any type of dock and deck and welcome island jobs as well. Contact us for any repair, winterization or new construction of your lake dock or deck. sheet and dimensional lumber, trims, drywall, insulation and cement products. The facility also has a full line hardware store. We supply material for home and cottage construction, decks, and roof repair. We are also a dealer for Dockmaster, and Fendock aluminium docks. Our service and knowledge are second to none. Delivery is available.